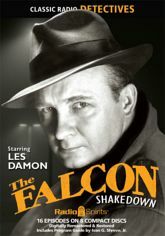 Les Damon stars as Michael Waring in sixteen more exciting adventures - taking on the troubles of ladies who are lost, dangerous, and deadly. Ken Lynch and Charles Webster co-star as Waring's police nemesis Sergeant James Corbett in these digitally restored and remastered tales of risky business, faithless families, blackmail, jail break, and murder. Jackson Beck, John Brown, Elspeth Eric, Ann Williams, and more radio regulars round out the cast. Come crack the cases, out the guilty, and rout the criminals!